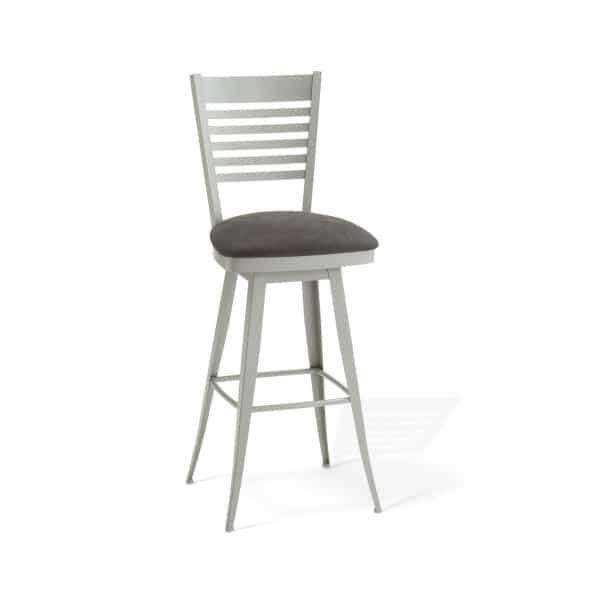 The Edwin Counter Stool is part of the Amisco offering of slick, urban-inspired designs. These stools are ideal for placement in a modern or minimalist kitchen setting. The Edwin Counter Stool ought to fit under any classically designed kitchen countertop. It measures 40.75’’ tall, and the seat sits at 26’’ so that it can slide easily under the table during times of non-use. The Edwin is constructed using an all-steel frame that is coated with a baked finish. The finish prevents the steel from incurring surfaces scratches. The seat features a plush cushion that is covered in fabric, and it sits on a 360-degree swivel. The seatback is decorative and supportive with a slatted design. Both the frame and the cushion cover fabric are customizable by you. The Amisco offering of finishes and fabrics is viewable below. Mix and match the frames and finishes that strike your fancy so that when your Edwin Counter Stool arrives at your countertop, it’s right at home.